The way it works most of the time is.. you get some nice light, but you just need to find something interesting to put in there with it. It promised to be a nice sunset last night, so Wendy and I headed out to Old Friends Retirement to find some unsuspecting subjects. We found the perfect volunteer in Marquetry. 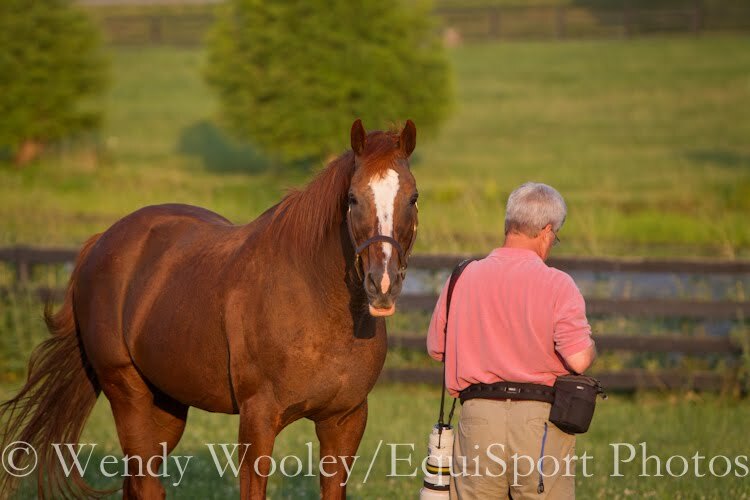 A little more about Marquetry from the Bloodhorse, "Bred by Prince Khalid Abdullah’s Juddmonte Farms, Marquetry raced for Juddmonte alone and in various partnerships. He captured three grade I stakes, including the 1991 Hollywood Gold Cup, and retired with earnings of $2,857,886." Marquetry at Old Friends. Photo: Matt Wooley, Aperture, F/5 @ ISO 800, 1/1000th, -1/3 EV, 300mm. 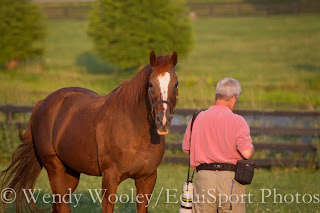 Marquetry was a more than willing to have his picture taken. I can't really recommend getting out in the paddock with a stallion you don't know, but the 24 year old retiree followed me around like a puppy dog. Well.. I had mints. I started off with a long lens, the 300mm in the above picture, to compress and control the background. I was 60 feet away for this shot. The obvious key to good backlighting is to have the subject somewhere between the camera and the light source. But what really makes the backlighting effect work is to ALSO find a dark background. 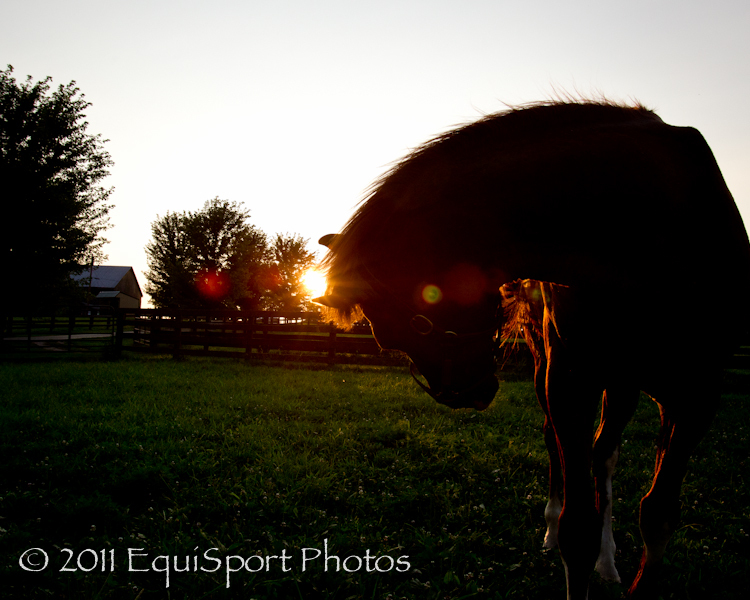 In this case, the sun is coming in over the dark trees, hitting the horse from behind. Be careful you don't let the direct sun hit your lens, use a lens hood to control flare. I then went to the other extreme with the 16-35mm. My thought with the wide angle was to "push in tight and shoot wide" as Joe McNally would say. Marquetry at Old Friends. Photo: Matt Wooley, Aperture, F/8 @ ISO 800, 1/1600th, -1/3 EV, 16mm. 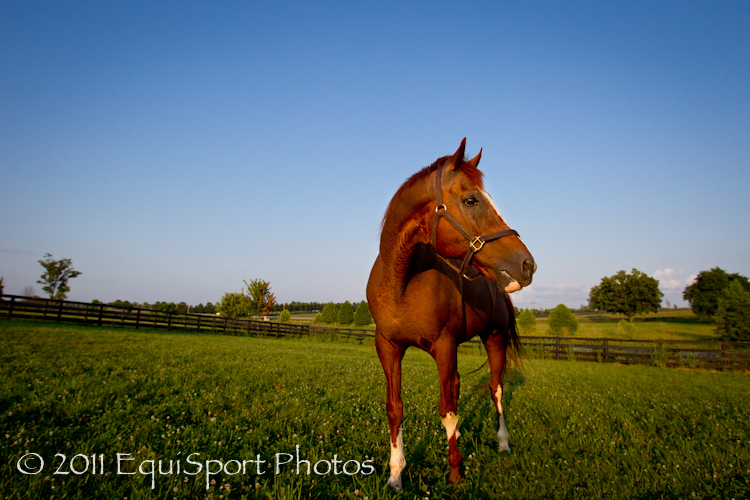 By pushing in tight with the wide angle lens, you give your subject prominence. I've added to that effect by shooting from a low perspective, placing the subject partly above the horizon line. The deep Aperture, and negative Exposure Value, give me nice color. Remember to "look both ways". As the sun drops a little lower, I use the wide angle to get a little color from the sun. I'm still at f/8 and -2/3 for this shot. Marquetry at Old Friends. 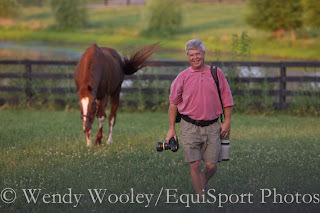 Photo: Matt Wooley, Aperture, F/8 @ ISO 800, 1/800th, -2/3 EV, 24mm. Again, I push in tight and pop the horse above the horizon line. I was about 6 feet from Marquetry for this shot. The sun is not so hot now and partly obscured, so with the sun hitting the lens I get some "creative" lens flare. Don't be afraid to try things to see what works. 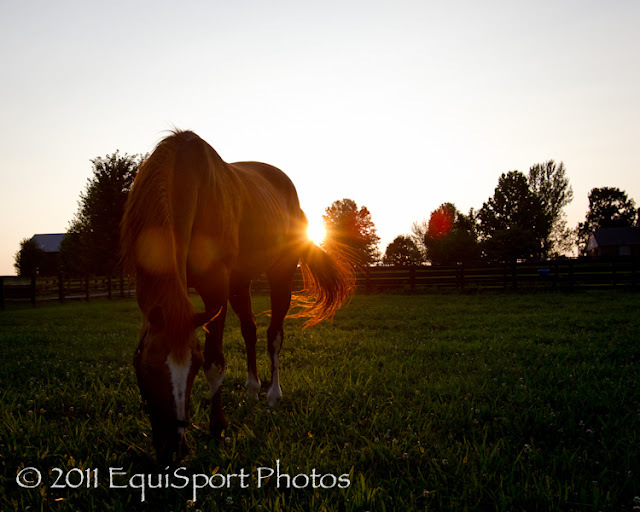 I shot over 250 frames in about 20 minutes, and ended up with 9 that I liked well enough to put up on the EquiSport Photos website. Marquetry at Old Friends. Photo: Matt Wooley, Aperture, F/8 @ ISO 800, 1/1000th, -2/3 EV, 24mm. Meanwhile, Wendy was focusing on Afternoon Deelites. From the Bloodhorse, "During his racing career, Afternoon Deelites was trained by Richard Mandella for owner Burt Bacharach. 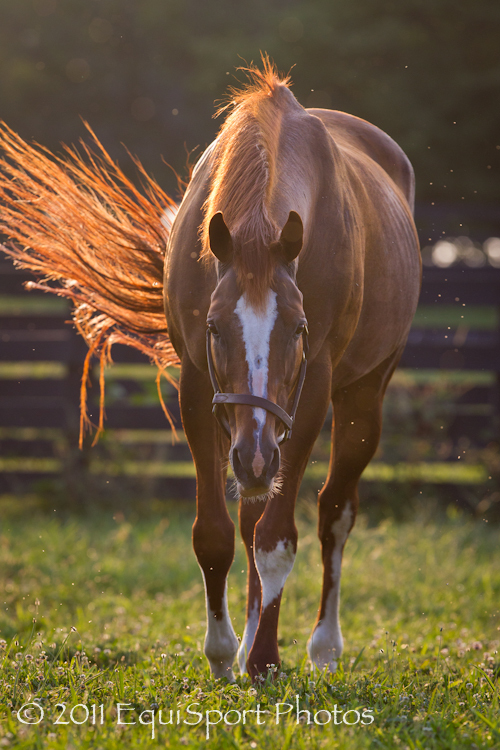 He was an instant success, winning his first three starts as a 2-year-old, including the Hollywood Futurity (gr. I) and Hollywood Preview Breeders’ Cup Stakes (gr. III)." Don't think you have to quit shooting just because the sun has set. 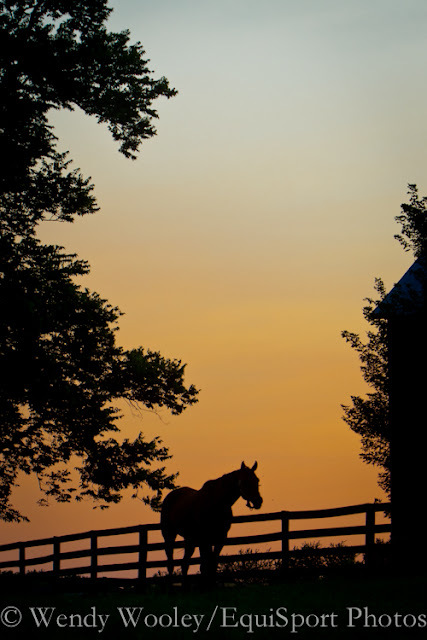 The twilight sky makes a golden opportunity for a story telling silhouette shot. Here Wendy has "exposed for the sky" by locking in a "fast enough" shutter speed. The negative Exposure Value helps add color. Learn to use the "Exposure Lock" button on your camera to expose for the sky. While in Aperture Mode, aim the camera at the sky, press the Exposure Lock button, then recompose your frame and take the shot. The result will be an image that is correctly exposed for the bright part of the frame, (the sky), and everything else rendered as silhouette.